Since its founding in 1928, Camp Huckins has provided a special kind of summer experience for each young person to cherish and carry with them throughout their life. The camp offers multiple activities meant to enrich the lives of the hundreds of girls who share in the Camp Huckins experience each summer. Camp Huckins is located in the town of Freedom, NH on approximately 200 acres. This includes an active waterfront on Ossipee Lake’s Broad Bay with 2800 feet of sandy shoreline and a private island. The cabins and program buildings are scattered amongst the beautiful New Hampshire pine trees. 4 tennis courts, an indoor athletic facility, trails for horseback riding, a large sports field, an outdoor basketball court, archery range, and a recently built outdoor amphitheatre overlooking the Bay are just some of the features that make Camp Huckins special. Other amenities include an open arts & crafts lodge, a ropes course, canoes, sailboats, kayaks, motor boats for waterskiing, as well as a tower, slide and diving board at the waterfront. Among fresh air and evergreens, Camp Huckins is a place to grow a lifelong love for the environment. We share values and teach skills that empower our campers to become environmental stewards and confident leaders. On 200 acres of forest, field and shoreline we laugh and make memories, but also recycle, compost, and preserve nature. These 175 solar panels on the Camp Huckins dining hall can generate up to 42.6 kilowatts of electricity. Since 2012 we have stepped up our sustainable practices by offsetting a majority of our electrical usage with solar panels. 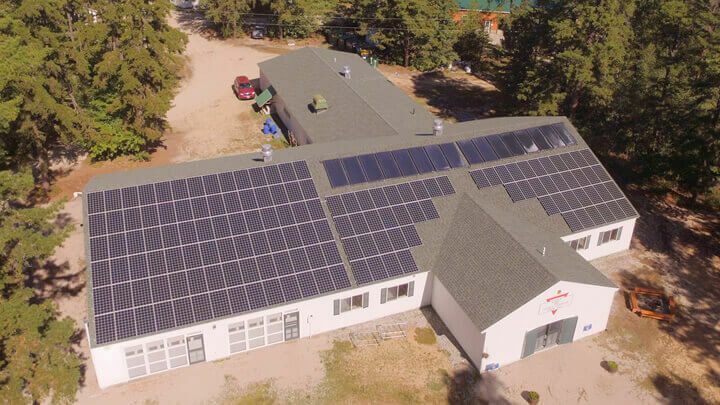 We worked with Brentwood, NH-based ReVision Energy to install a 7.92 kilowatt array on our bath house (which provides hot water through a series of highly efficient heat pump water heaters) and another 42.6 kilowatts on our dining hall in May of 2017. When the sun is shining, these 175 solar panels produce electricity that is either used in real-time by our camp, or fed back to the grid where it benefits our community and earns us a credit. A solar hot water array, also on our dining hall, helps to cut down further on our energy usage. Our solar arrays have become a highlight of our camp and a valuable learning tool – each morning our campers get an update on how much solar power was created the day before, giving them a first-hand look at renewable energy sources and how great of an impact we can have in defense of our environment. Each year, our systems will generate roughly 49,251 kilowatt-hours (kWhs) of electricity, offsetting the equivalent of driving over 89,830 miles in a gas-powered car. Our projects were financed through a Power Purchase Agreement (PPA), which means that the camp paid no upfront fee to install the solar panels. Instead, an investor (in this case, ReVision) pays for the upfront cost while the camp pays for the power generated from the solar panels each month, instead of paying for power from the grid. After a period of time, the camp can opt to buy the system from the investor (at a significantly reduced price) and own all the solar power generated outright!